The reigning Pro14 champions suffered their first home loss of the season on Saturday. The reigning Pro14 champions were beaten at home to Glasgow Warriors on Saturday. 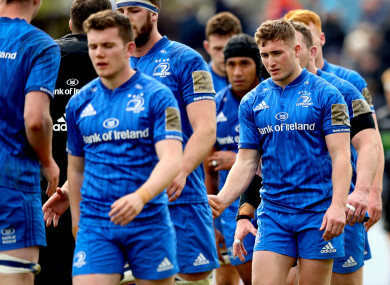 LEINSTER HEAD COACH Leo Cullen says his players have received a stark reminder of what losing feels like, as they fell of the pace and were beaten at home for the first time this season. Glasgow Warriors were rampant in their five-try success at the RDS on Saturday, becoming the first Scottish team to win away to Leinster in eight years. The Kearney brothers, Dave and Rob, scored twice each but Leinster’s warm-up for the Champions Cup semi-final clash with Toulouse ended in disaster. “It is a horrible feeling now,” said Cullen. “We lost a home game last year against Treviso. Glasgow, we knew was going to be a tough test for our guys. We are just building and building. We are where we want to be in the two semi-finals, and this is a good reminder for us of what losing feels like. There were green shoots, however, with Devin Toner playing the full 80 minutes while fellow returning Ireland international Robbie Henshaw almost got an hour under his belt. Tadhg Furlong’s withdrawal was just a precaution while Will Connors came off the replacements bench to become Leinster’s 56th player used this season. The 39-24 loss was chastening but Cullen believes the squad are primed to tackle Toulouse and move into another Champions Cup final. “The group are very fresh at the moment, at this stage of the season,” said Cullen. Overall, they have been managed incredibly well so we should have lots of energy left in the tank for the challenges that lie ahead. “That is what we have tried to do. We have tried to manage the group well. Some guys have had some time off, some guys have trained behind the scenes. “We have had a couple of injuries that have been well documented, but the health is very very good of the group. Email “Cullen urges Leinster to take lessons from Glasgow defeat after 'good reminder of what losing feels like'”. Feedback on “Cullen urges Leinster to take lessons from Glasgow defeat after 'good reminder of what losing feels like'”.